I hope everyone had a fabulous holiday season. We celebrate Christmas and had family in town. Now we are trying to justify our food choices and figure out a plan of action. This dish is on the menu for the week. 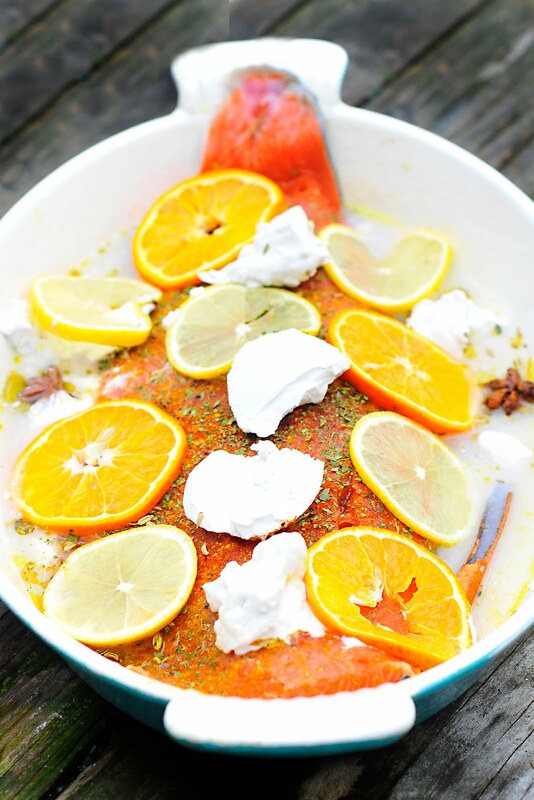 If you know a thing or two about Oregon then you know that Oregonians love their salmon. Our home sits on a bay. When the weather is good you will find many fishermen up early trying to land a popular Chinook Salmon. Driving around you will see these said fishermen piled into flat boats all fishing in the same place. Seriously, you will see 8-10 boats all together with their lines out. Sometimes you mights see 30 or 40 fishing boats in one spot. It's a sight to see and during PEAK season--good luck finding parking to even get your boat in the water. Personally I don't have that kind of desire to hunt fish with a community effort. If we go, I prefer sitting by a quiet creek with little to no foot traffic or boats by the dozen. We have yet to catch our own salmon. Cory bought the gear and has tried a few times with his brother from the shore but without a boat I hear it can be tough. Eventually we may have to get a boat. Although with the amount of rain we might be building an ark soon. For now I get our salmon like most people do. At the store. I try to buy the freshest pieces I can. Again, this is not hard in my area because we live in a fishing community and I go to the boat and buy it from the mornings catch. Yes, we are spoiled that way. If you read my blog, then you know that we don't eat much meat. We do eat fish on occasion. Let me explain. Our not eating meat has nothing to do with animal cruelty. I am opposed to inhumane conditions of these factory farms that are horrible to their animals. I don't buy from these places when we do eat meat. I try to shop locally from sustainable LOCAL farmers and fishermen. I know the people who are raising the little meat that we do eat. For me, it is a protein issue. My body does not like animal protein. I am able to eat fish without any visible or noticeable issues. For this recipe I wanted to try and experiment with spices and herbs. I went with a coconut and orange juice bath with slices of oranges and lemons. I added whole anise and cinnamon sticks while the fish was baking. I also seasoned with salt, pepper, thyme, garlic, and onion salt. Use any spices you want. My thinking was to go with flavors that I thought went well together: orange and cinnamon. These two flavors remind me of winter. It's winter. It's cold. 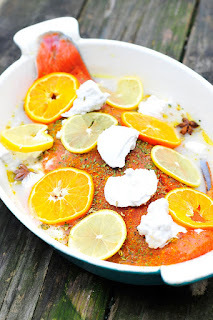 We had salmon. Simple stuff Maynard. 1. Preheat oven to 350. Oil a baking dish. Lay filet in the bottom of baking dish. 2. 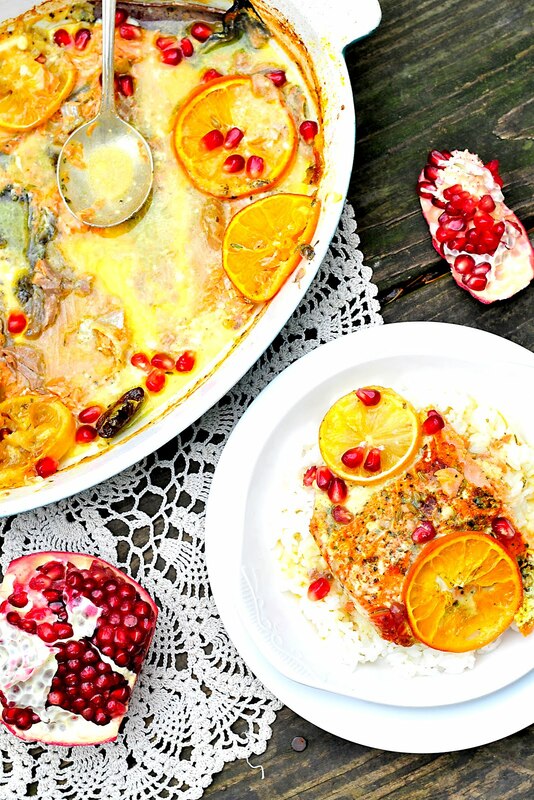 Add all of the ingredients (except the pomegranate seeds). The fat from the coconut milk I scooped on top (see picture above) and poured the liquid in the bottom of the dish. I seasoned the fish by sprinkling said spices across the top. I don't have a heavy hand and never measure this method. I use it for all of my fish dishes. It works for us. 3. Lay the slices of lemon and orange across the salmon. I added the juice from one orange to the coconut milk--notice the orange color when baked--to add flavor and to extend the broth. 4. 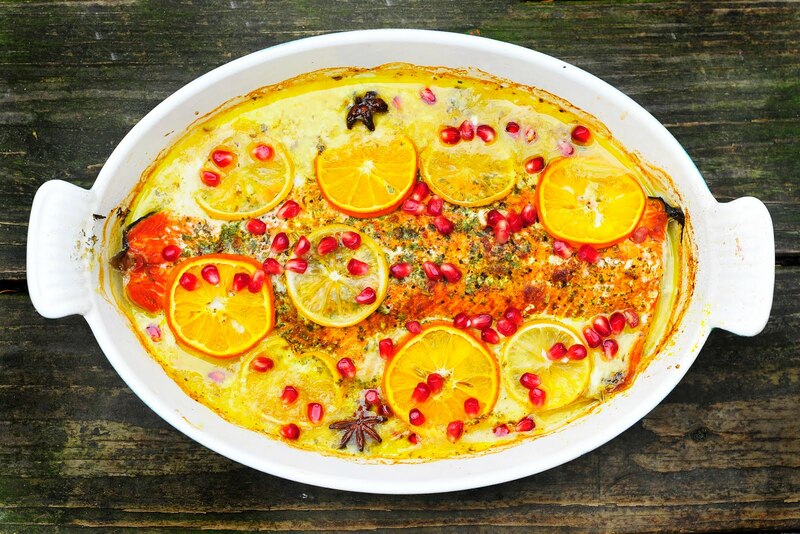 Bake fish until flaky. 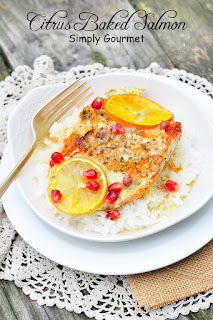 Salmon cooks fairly fast. I usually check it after 15 minutes. Each oven is different so keep that in mind. 5. 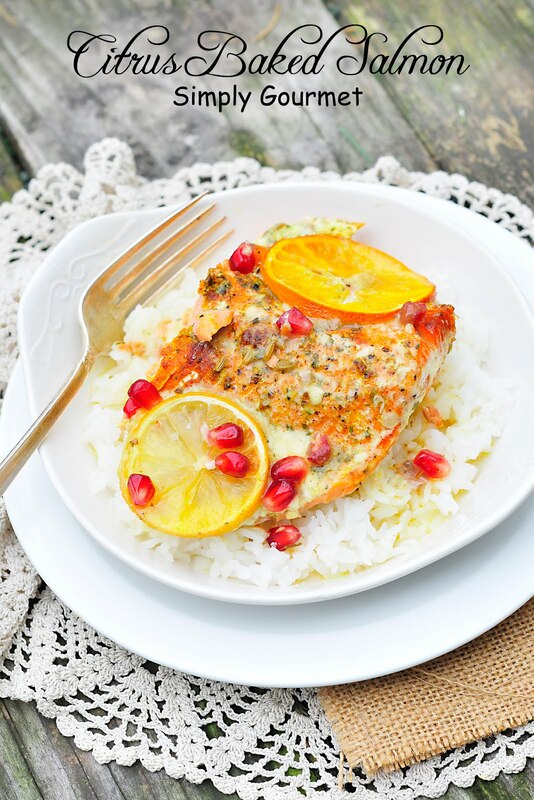 We serve the salmon in steaks over rice and sprinkle the pomegranate seeds for color and flavor.